NARUTO IS COMING TO A NEW GENERATION! With more than 13 million NARUTO SHIPPUDEN™: Ultimate Ninja® STORM games sold worldwide, this series has established itself among the pinnacle of Anime & Manga adaptations to videogames! NARUTO SHIPPUDEN: Ultimate Ninja STORM 4 Road to Boruto concludes the Ultimate Ninja Storm series and collects all of the DLC content packs for Storm 4 and previously exclusive pre-order bonuses! 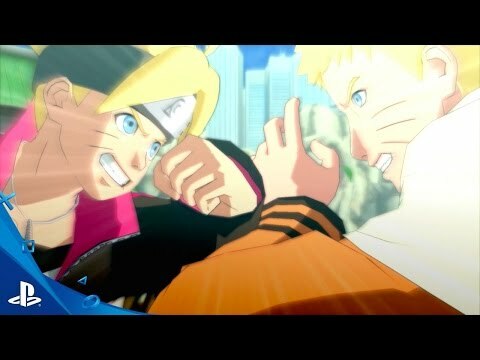 Not only will players get the Ultimate Ninja Storm 4 game and content packs, they will also get an all new adventure Road to Boruto which contains many new hours of gameplay focusing on the son of Naruto who is part of a whole new generation of ninjas. • New Generation Systems – With development made specifically to leverage the power of PlayStation®4. Road to Boruto will take players through an incredible journey of beautifully Anime-rendered fights! NARUTO artwork and elements © 2002 MASASHI KISHIMOTO/2007 SHIPPUDEN All Rights Reserved. © 2002 MASASHI KISHIMOTO/2007 SHIPPUDEN © NMP 2014 © 2002 MASASHI KISHIMOTO/2007 SHIPPUDEN © BMP 2015 SHONEN JUMP, NARUTO and NARUTO SHIPPUDEN are trademarks of Shueisha, Inc. in the U.S. and/or other countries. This product is manufactured, distributed and sold in North, South and Central American territories under license from VIZ Media, LLC. Game software © 2017 BANDAI NAMCO Entertainment Inc. All Rights Reserved.